Trove is a social reader app that might be fun to use, not just useful. 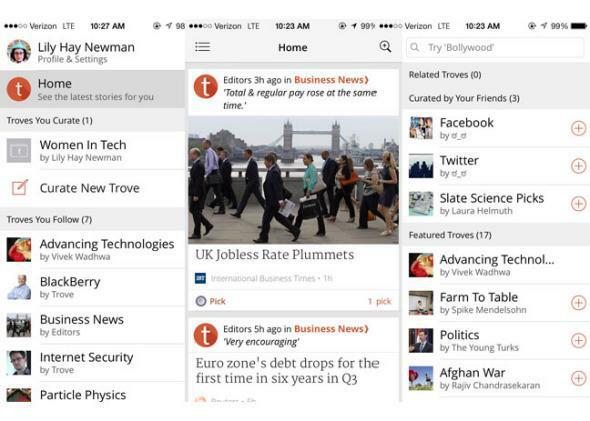 Can a Social Reader App Move From Useful to Fun? Trove lets you follow news channels, or “troves,” curated by other people and maintain your own troves on any topic. The death of Google Reader, may it rest in peace, was difficult for everyone. For those obsessed with Google’s RSS offering, the alternatives seemed annoying. Too welcoming, too enthusiastic, too slick. We had come to love the harsh utility and total reliability of Google Reader. And thing were tough for casual users, too. Which competitor should they switch to? What features were important? Maybe RSS was more trouble than it was worth. Trove currently pulls from 15,000 news sources and 40,000 RSS feeds to show content on a broad range of categories. Trove editors curate “troves” (see what they’re doin’ there?) about specific topics (women’s rights, cars, Star Wars) that you can follow or unfollow anytime to populate the feed of news that you’re seeing in your home screen. But people can also curate troves on any topic, and you can curate your own. If you look at the technology troves that already exist and you think you could do a better job curating certain types of stories, you can make another and base it on as many other troves as you want. Then you “pick” articles to go in your trove and your trove’s followers see those articles. If you don’t have time to pick things for your trove on a given day, Trove algorithms will fill in until you get back. The idea is that smart algorithms are honed by people. Trove is actually pretty fun to use. It has a pleasant interface and everything seems ready to go. The question is whether people will use it. News that Wikipedia is losing dedicated editors makes me think that things could be touch-and-go with Trove. It will only be a worthwhile service if it has a vibrant community of users following, sharing, and trying to perfect their own. But Trove has a hook that’s appealing: It gives users the opportunity to cultivate a “news-oriented persona” as Vijay Ravindran, Graham Holdings’ chief digital officer, says. That sounds like something people are already doing without realizing it on other social media sites, and it makes sense that there should be a particular place for people to strut their news stuff. Trove accounts can be linked to Twitter or Facebook so the app’s algorithms can figure out more about the types of news a particular user likes to share, but it’s not required. And users can also add the social media connection later. Things you “pick” or see on trove can also be shared to Facebook, Twitter, or both. And the Trove team hopes to integrate other social networks over time. Trove will try to capitalize on the 30 million users currently signed up for the Washington Post Social Reader, which was a popular Facebook application until some Facebook policy changes made it a less effective tool. With that user base as a jumpstart Trove might just get off the ground and become the place where news curation bragging rights are won and lost. Or it may fizzle like other social readers before it.